Richmond, Virginia-based artist Sonya Clark creates immaculately crafted woven constructions that use the tactile associations of fibers and optical effects of colors to reflect on socio-cultural constructions of identity, particularly in relation to race. Whether evoking the codes of African hair braiding or linking Modernist rationalism (as seen in Josef Albers’s formal color theories) and pseudo-scientific racial theories arising from color categorization, her works’ power lies in their suggestion of ritual or anthropological artifacts—purposeful, beautiful, and suggestive of some secret talismanic function. 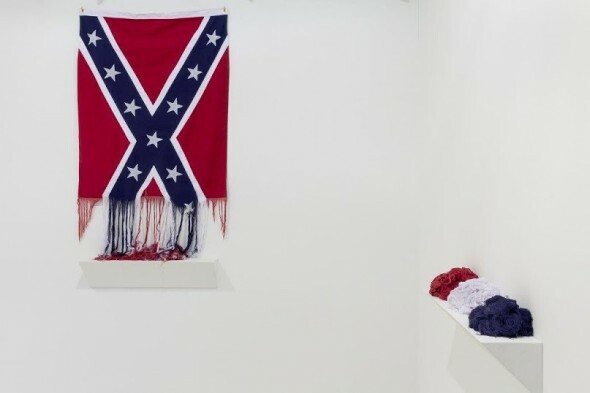 Clark reverses her usual labor-intensive constructive techniques in Unraveling, a work in which she methodically unweaves the Confederate battle flag. This is a metaphor for the need to pull apart the tightly interlocking social structures that continue to perpetuate patterns of racism throughout the U.S., in the de-facto segregation of many urban school systems, in the tragic deaths of African Americans at the hands of police officers in Ferguson, Baltimore, New York, and elsewhere, and in the invisibility to many whites of the poverty, unemployment, and crime that constitute inescapable cycles in many black communities. 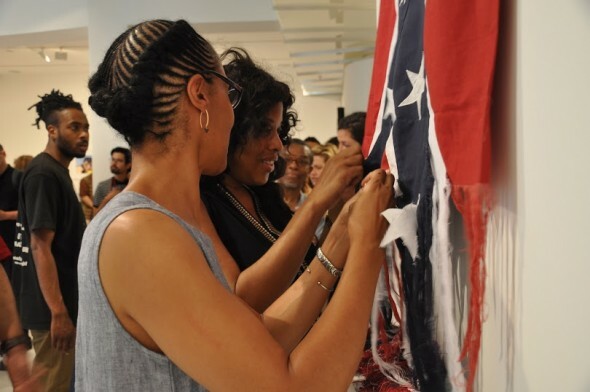 While the deconstruction of this flag would seem to most people to be a positive negation that symbolizes the need to dismantle racial inequities that are deeply woven into American life, defenders of the stars and bars may feel that it is a desecration. They have argued that the flag is a sacred symbol of Southern history, of a general sense of rebelliousness against authority, and of the defense of states’ rights. Yet images of Charleston mass-murderer Dylann Roof draped with the same flag make it impossible to pretend that it is not also a galvanizing and virulent symbol of racism. The slowness of the dismantling mirrors the larger challenge of breaking apart the legacy of racism. The process encourages meditation on the time it takes to methodically change the ingrown habits of society. The work’s poetic power derives in part from its finitude; the flag will someday be completely dismantled. When it is, the question of what meaning the viewer will draw from the consummation of the act is partly answered by an earlier work titled Unraveled, in which the flag has been completely taken apart and divided into balls of red, white, and blue thread. Perhaps this companion work conveys optimism regarding an evolution toward an America unified under these colors. But there is a subtle irony as well: the separation of the threads is a form of disintegration; that is, the opposite of integration. It is a reminder that the constituent colors of the Confederate flag connect it to the U.S. flag—dismembering the emblem of the Confederacy does not automatically lead to a dismantling of the de-facto segregation that still mars American civic life. In pitting the transformative potential of this deconstructive performance—which took place this past summer in New York’s Mixed Greens gallery with a participatory audience (fifty people working together undid less than one inch of the flag)—against the virulent endurance of a symbolic object that is widespread and may be replicated ten thousand times over, one might ask if this is simply a pebble in the wrong shoe (the question often asked of activist art that reaches sympathetic audiences in galleries or museums but may remain unseen by the people the artist most hopes to affect). Yet the online image of Unraveling, on Facebook and Artnet.com, to start, could extend virally and infinitely as the work progresses toward its happy demise. With this widening exposure, the image can become firmly planted in the mind’s eyes of a huge number of people, maybe even some apologists for the Lost Cause. After seeing it, who could look at the stars and bars without imagining its companion, this shredded ghost that Clark has so carefully unmade?